Does your job require you to service machines or equipment? Do you need OSHA training on controlling hazardous energy (lockout/tagout of equipment)? This online lockout/tagout course is based on the OSHA Control of Hazardous Energy (Lockout/Tagout) regulations as outlined in 29 CFR, Part 1910.147. OSHA requires that anyone who is involved in working around energy systems such as electrical, mechanical, hydraulic, pneumatic, and others receive Lockout/Tagout training. This two-hour course will help to satisfy the OSHA requirements for training as detailed in the OSHA regulation for those who are working in areas where Lockout programs are in place, or whose job requires them to actually do the Lockout and isolate the energy sources. 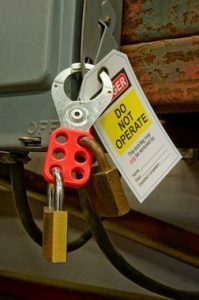 Define what is meant by Lock Out Tag Out (LOTO or Lockout/Tagout) and when it is used. Identify the importance of LOTO. Understand the roles and responsibilities of those involved with LOTO including LOTO users, those who may come across LOTO, and employers. Know the requirements of the OSHA LOTO regulations and where to find them in 29 CFR1910.147. Know the different types of LOTO training and how they apply to the job. List the three parts of a LOTO program including the development of a written program, the training of employees and how and when to implement the LOTO program. Understand how and when LOTO “refresher” training is to be conducted. Understand and define the different types of energy that might be encountered using LOTO. This includes potential energy, kinetic energy, electrical, hydraulic, pneumatic, and water/gas energy. List the requirements of an Energy Control Program. Know how and when to properly apply locks and other devises as part of a LOTO program. Understand the advantages, disadvantages and limitations of locks and tags as part of a LOTO program. Be able to list the steps of applying LOTO on the job. This includes proper notification, awareness of energy hazards, controlling the hazards (including blanking and bleeding off energy), applying LOTO, performing the work, removing equipment used and LOTO equipment, restarting the equipment and making proper notifications. Understand considerations when working with outside contractors and LOTO.